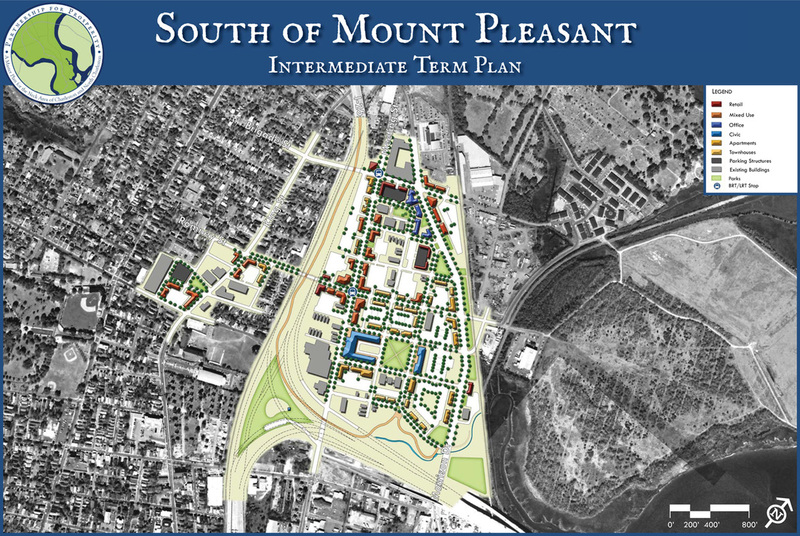 The South of Mount Pleasant Street catalyst area, located just north of downtown Charleston and the established residential neighborhoods that surround the Citadel and Hampton Park, is a community gateway. 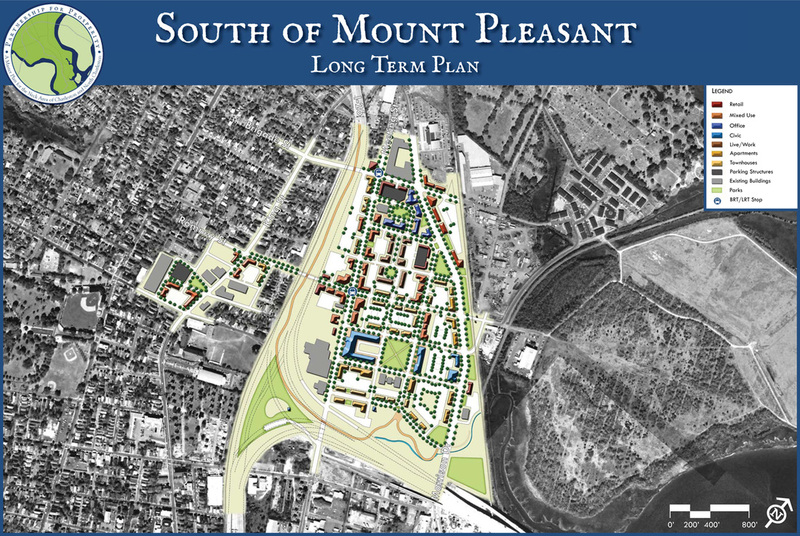 It is still part of the well-connected grid system that originates in the historic district, with Meeting Street and King Street, primary roadways providing access to downtown from points along the peninsula, running through the heart of the catalyst area. 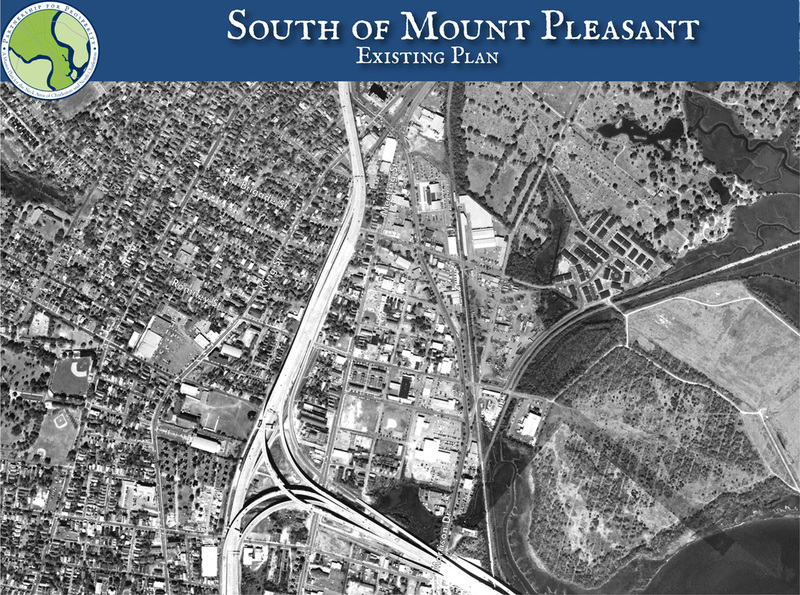 Both I-26 (coming from the northwest along the peninsula) and US 17 (coming from the northeast and Mount Pleasant) have exits providing direct access to major roadways in this gateway area. There are two large sites (Bridgeview Village and the former Promenade development area) that are located along the Cooper River east of the railroad tracks with single points of entry. As freight traffic increases, these areas may face access issues and vehicular delays. This catalyst area is located within the Gateway District of the Charleston Digital Corridor. This initiative, a creative effort to promote Charleston’s “knowledge community,” offers incentives, resources, and support to entrepreneurs and professionals in an effort to facilitate a business and social environment where technology companies can thrive. With companies like Radiate Technologies and Equiscript LLC already established in areas along the fringes of the catalyst area, the Charleston Digital Corridor is actively marketing sites on Meeting Street to prospective occupants. The area should take advantage of this established marketing network to further promote and develop catalyst opportunities along both Meeting Street and Morrison Street. Building sizes in the southern portion of the catalyst area are envisioned as mid-rise (3-5 stories), similar to the scale of the Cool Blow building, with one or two landmark buildings at 7-9 stories in order to visually rise above the elevated interstate sections located along the perimeter of the area. This height would also allow views of the Ashley and Cooper Rivers and be an orienting gateway feature for travelers entering Charleston. In the northern portion of the catalyst area, building sizes are envisioned as low-rise (1-3 stories) to act as a transition and complement the scale of existing uses. Meeting Street runs along the western edge of the catalyst area and serves as its connection to the transportation spine that connects the entire Neck area both internally and to points beyond. New transit stops for a future Bus Rapid Transit (BRT) or Light Rail Transit (LRT) system are planned for the intersections of Meeting Street with Brigade Street and Romney Street. An extension of the existing shared-use path under I-26 improves accessibility for non-auto travel modes. The grid street system within the catalyst area facilitates pedestrian and bicycle connections to transit and other places within the area. 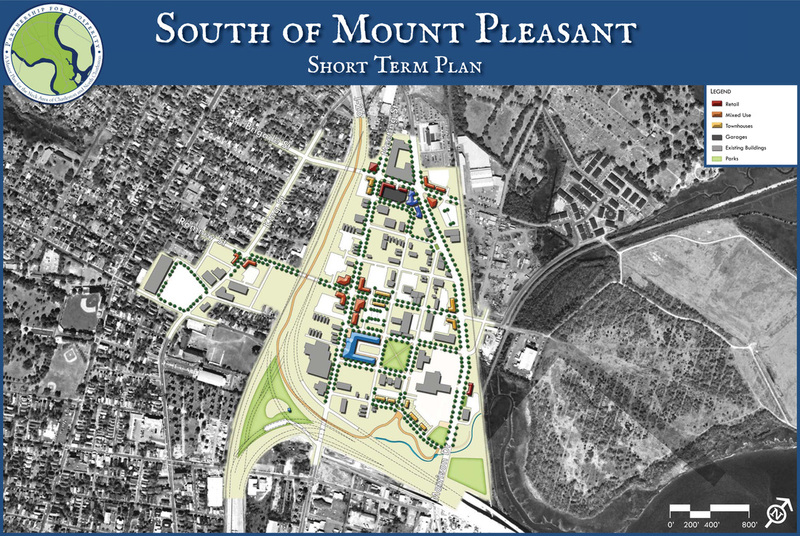 While the short-, intermediate-, and long-term phasing within this catalyst area will be dependent on a combination of economic conditions, regulatory policies, capital funding, and free market forces, the following graphics illustrate a general sequence of infill development, redevelopment, and preservation that could occur within the catalyst area, based on community input and the development forms described above. The projects shown are meant to convey a conceptual progression of planned and orderly development within the area, not to dictate future uses or specify time frames for individual private properties. (Note: this is typical for the phasing in all of the catalyst areas).